Designed by Ralph M. Unger in 2006. Published by Profonts. Rhapsody is a font revival which is based on the original font Rhapsodie by Ilse Schüle. The original design was published by Ludwig & Mayer in 1951 and due to its new unique form at that time quite popular among metal types. Rhapsody is really easy to read. The calligraphic forms of the uppercase in connection with its lowercase appear very special and still very unique. 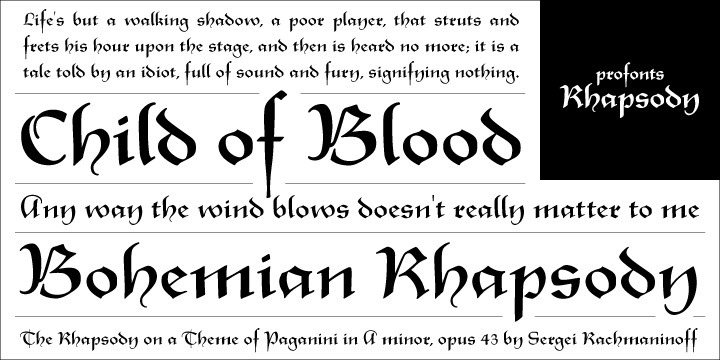 Rhapsodie was redesigned expanded by Unger for the profonts library. Rhapsody® is a registered Trademark by Bauer Types SA. Rhapsody supports up to 73 different languages such as Spanish, English, Portuguese, German, French, Turkish, Italian, Polish, Kurdish (Latin), Romanian, Dutch, Hungarian, Kazakh (Latin), Czech, Serbian (Latin), Swedish, Croatian, Slovak, Finnish, Danish, Lithuanian, Latvian, Slovenian, Irish, Estonian, Basque, Icelandic, and Luxembourgian in Latin and other scripts.